Jose Antonio Aboitiz, a member of Cebu’s most respected business family, started this project last year. 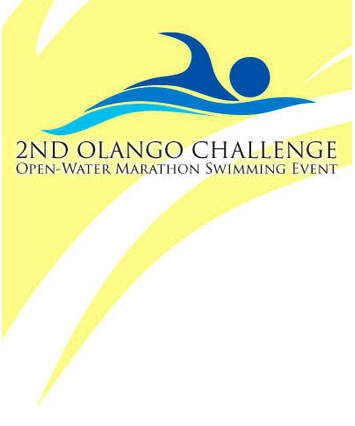 The 2nd Olango Challenge, it’s called, and yes, at first thought, it’s an intimidating mission: to swim, amidst the open waters along Mactan, the distance of 6,400 meters. My thoughts at first? I’ve done a 6.4K distance. On land! But swim? For 6.4 kilometers? Tonio Aboitiz, the Chairman of the Philippine Business for Social Progress (PBSP) in the Visayas, said those words when we met last Wednesday at the Casino Español for the press conference, also attended by Lex Reyes of PASA and Rudy Villanobos of Lapu-Lapu City. 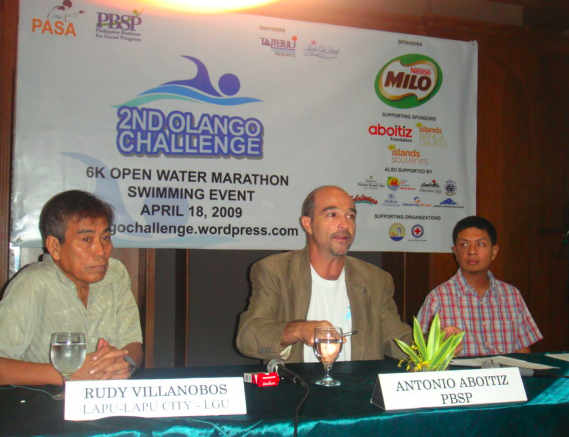 “In partnership with the Philippine Amateur Swimming Association (PASA),” said Mr. Aboitiz, “the PBSP will host the 2nd Olango Challenge on April 18. More than 80 seasoned, competitive as well as amateur swimmers from all over the country are expected to join the Philippine’s only open water marathon swimming event. “This year’s Olango Challenge is designed as a 6-km. coastwise swim rather than a channel crossing, and will begin at the pier of Pacific Cebu Resort and end at the beachfront of Tambuli Beach Club. “The OLANGO CHALLENGE is an annual fund-raising event for the benefit of the children of Olango. The event highlights the importance of having a clean marine environment, raises awareness on the magnitude of preventable drowning incidence in the Philippines and promotes open-water marathon swimming as a sport in which Filipino swimmers should excel. Yes, mark that date: April 18 at 1 p.m. That’s the exact time when nearly 100 swimmers—from Cebu, Davao, Manila and some to include foreign participants—will freestyle and breast-stroke their way along Mactan’s top beach resorts. Who can join? Anyone who’s aged 14 and older. Cash prizes are P15,000, P10,000 and P5,000 for the 1st, 2nd and 3rd placers, respectively. The fee is P500 for PASA, TRAP, PFF and PhilSPADA members. These are the elite swimmers—those in varsity teams who compete regularly. How about the recreational swimmers? Those who don’t aim to win but want to join to finish the challenge? Sure. Take Jay Aldeguer, the well-respected entrepreneur of Islands Banca Cruises—he finished the 5K swim last year and will join again next month. With the amateur swimmers, what’s good is that the use fins, masks and snorkels are allowed. Those joining this category, though, have to pay P2,000. Why the bigger amount? Because this event is a fund-raiser: it aims to raise funds to build classrooms at the Candagsao Elem. School on Olango Island. Interested to join? Call or email Riva Valles at 232-5270 / olangochallenge@gmail.com. Whoa this is the first time I heard of a swimming marathon. The longest swim I knew was crossing the Mactan Channel. Good luck if you plan on joining.